God Made All of Me is Available Now! 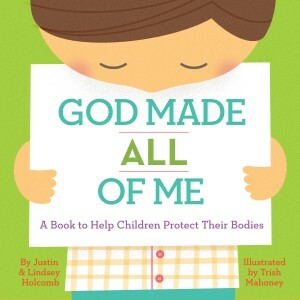 God Made All of Me: A Book to Help Children Protect Their Bodies is available now. Do you have children or do you have friends with small children? This is a book that will benefit parents for years to come, so please help get the word out. This simple and relatable story, designed to help children protect their bodies, will be an important resource for every family with young children. “About one in three girls and one in seven boys will be sexually abused during childhood.” —National Sexual Violence Resource Center, Child Sexual Abuse Prevention: Programs for Children, 2011. ​“A child is much more likely to be sexually abused by a recognized, trusted adult than by a stranger.” —Roland C. Summit, “The Child Abuse Accommodation Syndrome,” Child Abuse & Neglect, Vol. 7, 1983: 182; and Jon R. Conte, ed., Critical issues in Child Sexual Abuse (Thousand Oaks, CA: Sage Publications), 122. “Most victims of child sexual abuse know their attacker; 34% of assailants were family members, 58% were acquaintances, and only 7% of the perpetrators were strangers to the victim.” —US Bureau of Justice Statistics, 2000Sexual Assault of Young Children as Reported to Law Enforcement (2000), see Table 6 on page 10. “Incorporating parents into prevention efforts makes child safety training most effective.” —National Sexual Violence Resource Center, Child Sexual Abuse Prevention: Programs for Children, 2011. “Involvement by parents is crucial because 65% of social workers, 53% of doctors and 58% of physician assistants do not report all suspected cases of child maltreatment. Several studies document that even medical professionals often miss cases of child abuse or fail to report suspicions.” —Steven Delaronde et al, Opinions Among Mandated Reporters Toward Child Maltreatment Reporting Policies, 25 Child Abuse & Neglect 81, 88 (2000); David Finkelhor, Is Child Abuse Overreported? 48 Public Welfare 22, 25 (1990); E.G. Flaherty, et al, Pediatrician Characteristics Associated with Child Abuse Identification and Reporting: Results from a National Survey of Pediatricians, 11(4) Child Maltreatment 361 (2006); E.G. Flaherty, et al, From Suspicion of Physical Abuse to Reporting: Primary Care Clinician Decision-Making, 122 Pediatrics 611 (2008); and V.l. Gunn, et al, Factors Affecting Pediatricians’ Reporting of Suspected Child Maltreatment, 5(2) Ambulatory Pediatrics 96 (2005). “Personal safety education involves simply telling children that the parts of their body covered by bathing suits are not supposed to be touched by others and, when they are, they should tell someone. If the person they tell doesn’t believe them, they should keep on telling until they are believed. In addition to teaching the children personal safety, it is important to provide instruction to the parents so that they can reinforce these lessons at home and will know how to respond if a child makes a disclosure. Many teach fire safety, school crossing safety, or even swimming safety and yet bristle at the thought of personal safety designed to empower children to protect themselves against offenders.” —Victor I. Vieth, “Suffering the Children: Developing Effective Church Policies on Child Maltreatment,” Jacob’s Hope (Vol. 2, Issue 1, June 2011).